For a variety of reasons, the number gathered at my Thanksgiving table this year was quite small. This was a first for me. My extended family isn’t huge….but the small gathering was still unprecedented. Heading into the day, I was a bit bummed about this. But in the end, it turned out to be a lovely, unusually peaceful day. It was, in fact, a year of many delightful “firsts”. One of the gifts that came as a result of our small number was my first opportunity to enjoy Thanksgiving dinner on my grandmother’s “turkey” dinner plates. I don’t know how many plates were in the original set, but only three have made it to my generation. There were probably never very many…even as a child, we never ate off of them when we gathered for the large celebrations in her home. But I heard her refer to them…and I know they were special to her. Using them for our Thanksgiving meal this year was a pleasure. Another first of the day was pecan pie. I know this is a staple on many family tables, but it never appeared on ours. My family is quite attached to their tradition of pumpkin and mincemeat pies, so this is what we always have. 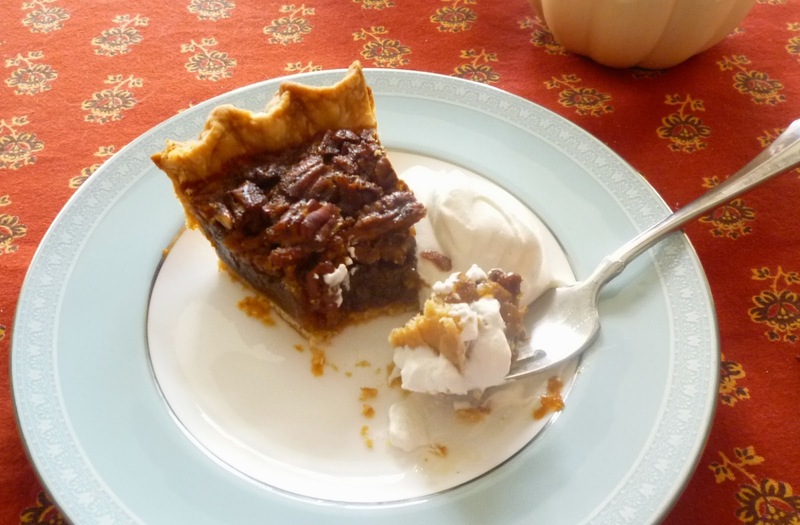 There is nothing wrong with either of these pies…mincemeat pie is in fact a personal holiday favorite….but there are other holiday pies in the universe and I have always wanted to branch out a bit. This year was the perfect opportunity. The pie that I made was a bit unusual, and because of that I thought it worth sharing here. 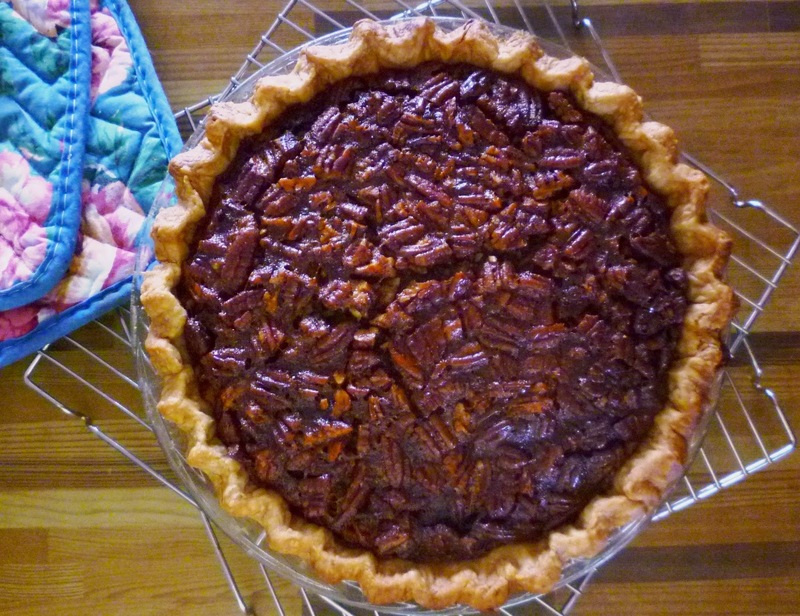 Heading into Thanksgiving morning, I fully intended to make my friend Nancy’s version of pecan pie (the one she teaches in our joint class). 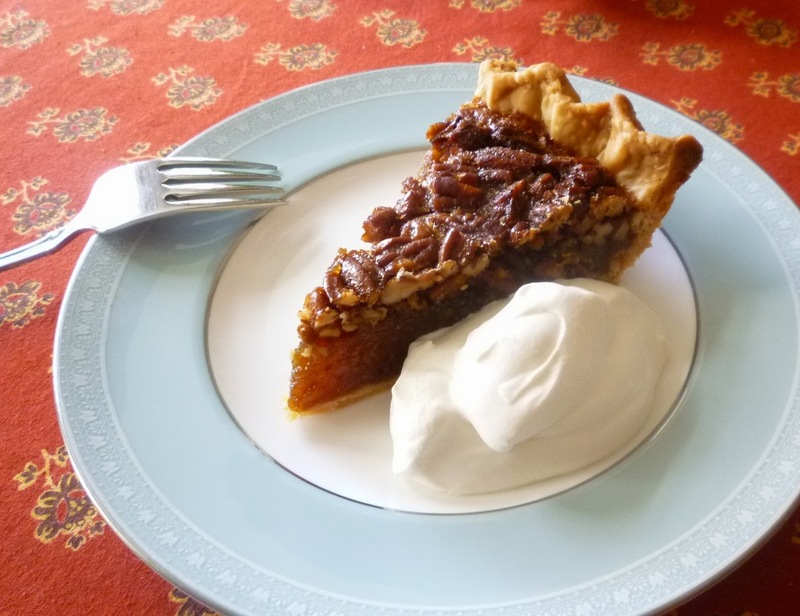 But for some reason on Thanksgiving morning, I was flipping through Rose Beranbaum’s Pie and Pastry Bible and I noticed that she used Golden Syrup in her pecan pie instead of the more traditional Karo Syrup. For those unfamiliar with Golden Syrup, it is a British staple. It is a cane syrup rather than a corn syrup and it has a unique—I think it’s a bit caramel-y, but some say buttery—and delicious taste. Karo’s corn syrup by comparison is relatively flavorless. Since I always keep a jar of Lyle’s on hand in case I happen to be in the mood for gingerbread, I decided that while I was doing different, I should really be different and substitute Lyle’s Golden Syrup in the recipe. It is an inspired substitution…. the pie was delicious. On a technical note, because Lyle’s has a higher saturation of sugar than Karo syrup, I decided to use just a bit less. The resulting pie was firmer than usual, but I liked it this way…it sliced beautifully. 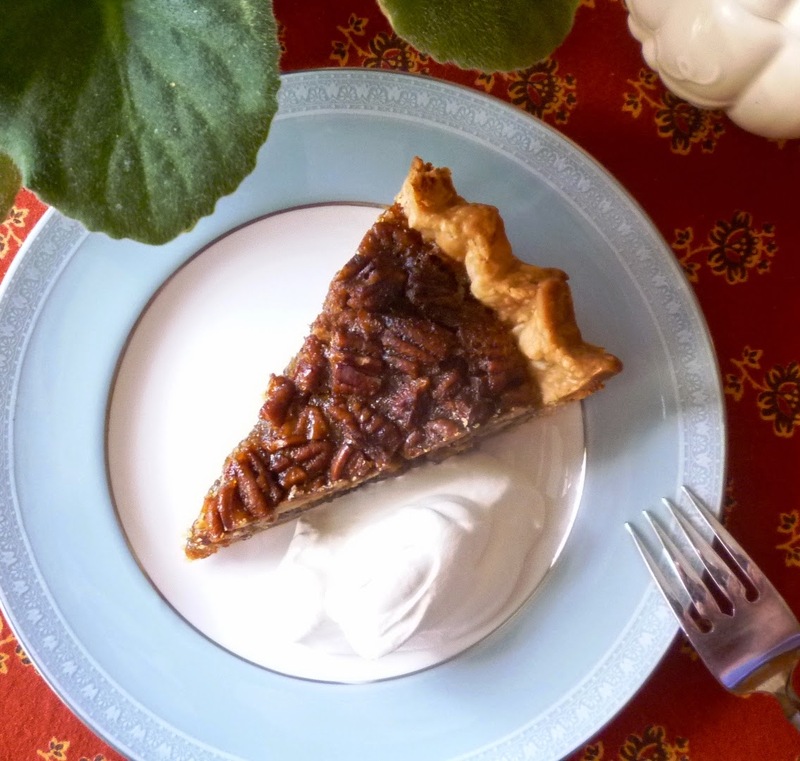 If you prefer the softer set of a traditional pecan pie, just add a couple tablespoons of water (or Bourbon….or brandy…) to the egg-sugar-syrup mixture. The easiest way to do this would be to place two tablespoons of water in a one cup glass measure and then add Lyle’s syrup to make 1 cup. Finally, because our meal was smaller than usual, the mountain of dishes after the feast was also comparatively small. So after the meal, I experienced another first. I made turkey broth. I know this is probably a shock to hear since I am a chef. But I have just never bothered. There is so much else to do during the clean up…and I have never been terribly motivated to do that one more thing. 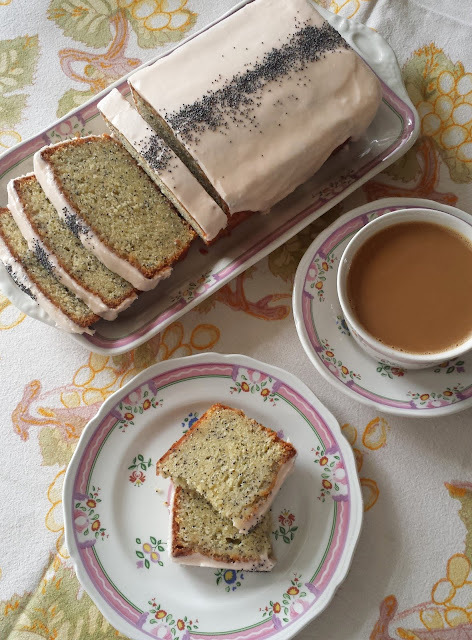 But this year, as I looked around the kitchen, I noticed that the stove wasn’t covered in used pots and pans….and the stock pot had not been used for other things…. It was an easy thing to drop the turkey carcass into a pot and let it simmer away while I cleaned up the kitchen. And I was so glad I did. On Saturday night we had a simple turkey soup with vegetables and rice. I’m not sure I have ever used Thanksgiving leftovers for soup. We always have sandwiches…tetrazzini and other casseroles…salads…etc. etc. Thus, one more unexpected first. And as we sat down last night to enjoy our turkey soup, I realized why it is such a traditional and fine use of leftover turkey (and broth). After a couple of days of rich holiday foods, the comparatively austere soup was truly soothing. I will definitely be adding soup to my rotation of uses for leftover turkey. You can probably put anything you like in a “leftover turkey soup”…but it will be better if you adopt a less-is-more mentality (your soup probably doesn't need stuffing...or a big mish-mosh of left over cooked vegetables). I started with a basic onion, carrot, celery and thyme base and added cubed sweet potatoes, shredded Brussels sprouts (both left on hand from purchasing too much ahead of the big meal), Basmati rice and turkey. The Basmati rice was a wonderful addition, subtly perfuming the soup with its unique aroma and flavor. But if you don’t keep it on hand, regular long grain rice …or orzo pasta…or farro… would be fine. As I mentioned at the first, I had a very nice Thanksgiving. Delightful moments...big and small...added up to a pretty special day. It is so unfortunate that at this holiday time of the year, it is so easy to be disappointed. I confess I have been guilty of this. But this year, since I had no expectations for this particular holiday, I found that there were so many things to enjoy. I’m not a person who makes personal lists…resolutions at New Year’s…things I’m thankful for at Thanksgiving….but if I were, this year at the top of the list of things I’m thankful for would be that I had the rare opportunity to open my eyes and see the delights that are there….rather than being disappointed about the expected things that are not. And from this vantage point, the list of things for which I am grateful becomes very long indeed. 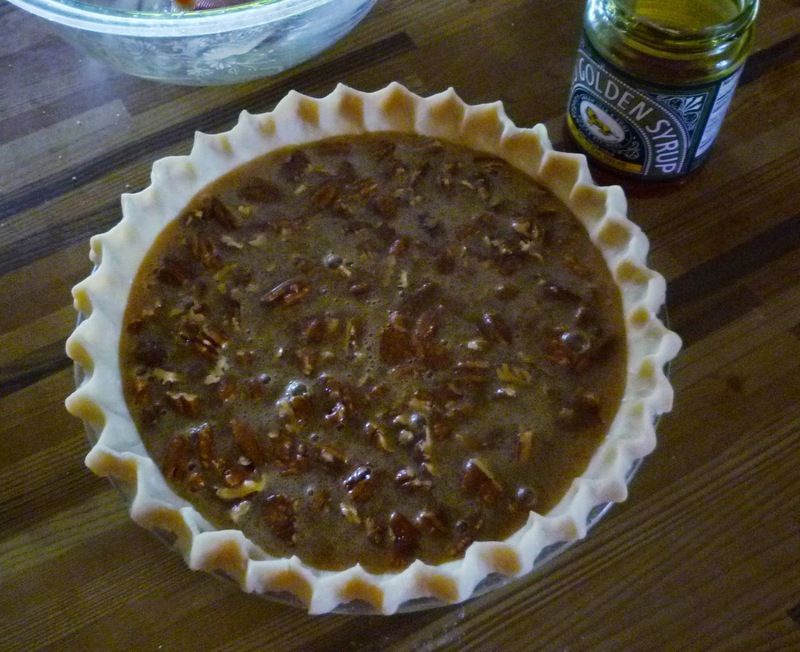 Scatter the pecans over the bottom of the pie crust. In a large bowl, whisk the eggs, brown sugar, golden syrup, butter, vanilla and salt. Pour into the pie shell. Place pie in the oven and bake for about 30 minutes. Carefully tent the pie with foil, to prevent over browning. Continue to bake until the pie is set—another 30 minutes or so. It will still be a bit jiggly, but a knife inserted in the center should come out moist but not liquid. Cool 4 to 6 hours before slicing. Use a sharp serrated knife to get the cleanest, most precise slices. Note: If you like, place two tablespoons of water in your measuring cup, then add Lyle's syrup to make 1 cup. This will give you a cup of syrup that has roughly the same sugar saturation as Karo syrup. The pie is delicious and slices beautifully as written, but if you are trying to mimic the texture of a corn syrup based pie, the added water will get you closer to it. Combine the flour and the salt in a medium-sized bowl. Rub the butter into the flour until the butter is in small pea-sized pieces. Drizzle 3 T. ice water over the flour/butter mixture. Using your hands, fluff the mixture until it begins to clump, adding more water if necessary. If, when you squeeze some of the mixture it holds together, the dough is finished. Turn the dough out onto a counter and form into a mound. Using the heel of your hand, gradually push all of the dough away from you in short forward strokes, flattening out the lumps. Continue until all of the dough is flat. Using a bench scraper, scrape the dough off the counter, forming it into a single clump as you do. Wrap in plastic wrap, pressing the dough into a thick disk. Chill for at least 30 minutes. To roll out a bottom crust, let the disk of dough warm up for a moment or two. Butter a 9-inch pie plate and set it aside. Flour the work surface and the rolling pin. Begin rolling from the center of the dough outward. After each stroke, rotate the dough a quarter turn—always making sure that there is sufficient flour to keep the dough from sticking. Keep rolling and turning until you have a round of dough that is about 1/8 to 1/6 –inch in thickness. Using a lid or an upside-down bowl, trim the dough to form a 13-inch circle. Brush off the excess flour and fold the dough circle in half. Slide the outspread fingers of both hands under the dough and gently lift it and transfer it to the prepared pie plate. Unfold the dough and ease it into the pan being careful not to stretch it. Fold the extra dough under along the rim of the pan so that it is double in thickness. Crimp the edge. Chill the pie shell for at least 1/2 hour before filling. In a large saucepan over medium heat, melt butter. Add the onion, carrot, celery and thyme along with a pinch of salt and sweat until very soft (about 15 minutes). Add the sweet potato and cook until hot and beginning to sizzle in the butter. Add the stock and bring to a boil. Taste and season with salt. Add the rice, return to a simmer, cover and simmer gently for five minutes. Add the sprouts, return to a simmer and cook until the sweet potatoes, rice and sprouts are tender—another 10 minutes or so. Taste and correct the seasoning. Remove from the heat, stir in the turkey and cover and let sit for five minutes to warm the turkey through. Makes a generous quart of soup. Turkey broth can be made simply by placing the roast turkey carcass in a stock pot, covering by an inch with cold water and gently simmering until flavorful...two or three hours. You may of course add onions, carrot, celery, etc. as for a traditional stock if you like. Don't boil the soup after you add the turkey...it will make the turkey hard and chewy...particularly if you are using white meat. What a great Thanksgiving post Paige. I share your feeling about the weight of making a turkey broth when you have done so much already. But I have always made broth and am glad I do afterward. You cannot buy that kind of broth anywhere. And I feel like I am honoring this great bird's life just a little longer. Thank you Judy... I love your attitude about honoring the life of the bird--great motivation to use every little bit!